The Australian superannuation industry is going to face continued legislative changes this year – after all change is part of our culture these days. However, looking beyond that what are the business and technology drivers that you need to know about for 2017? I wanted to share my thoughts on the areas that I think will challenge us all. Cadence – this year we will see the landscape of technology platforms such as record keeping systems, mobile technologies and web services within funds and Third Party Administrators developing at different paces. The message for funds is prepare yourselves in 2017 for decisions that you need to take in 2018 – you will need to take care of the spade work this year or else face considerable challenges in the years to come. Increasing competition – initiatives such as Single Touch Payroll, new reporting to the ATO and efficiency benchmarking by the Productivity Commission are all part of making us even more efficient this year. A greater increase in transparency will also see any manual processes left in the member journey more obvious to the member – and it’s not something that they want. Being efficient will be more important than ever but too will be how this differentiates you from the rest. My advice – find your niche, whether you are large or small. The specialist projects are already underway! Customer experience is front and centre – delivering on the real promise of a premium customer journey means you need to get it right at the front end and the back end, particularly when it relates to the opportunities that big data can offer. As these systems move at different speeds you need to plan accordingly. Development of the new MyRetirement product should also take the retired customer experience to a new level! Insurance – our new buzzword.2017 will see a lot of pressure on how insurance operates in super. Currently we see a gap in the understanding of insurance in super from the member perspective. Unlike domestic insurance for home and contents, insurance claims in super are seriously life changing events. It is more important than ever to have a trusted partner woven into the customer experience layer. Risk and response –The recent outage for the ATO is a small but telling window on how co-dependent we are with enabling services, such as the ATO and other connected entities. It is a risk we need to address and we need to formulate the appropriate responses in such a co-dependent world. The same rigour should apply to disaster recovery practices and business continuity strategies. These five core areas are all part of our journey, along with the things that also remain important – the continuity in default funds, integration of independent directors to name a couple. Over Christmas I read a fascinating book, ‘Team of Teams, New Rules of Engagement for a Complex World’. Its author Gen. Stanley McChrystal outlined the move to a more complex system of interdependent and independent team of teams in a more complex – not complicated – world. Granted we aren’t in a military situation, we are still impacted by external influences and delivering value to members in a complex environment versus a complicated one is galaxies apart. Advanced technologies have seen us all arrive at this destination but for many of us it wasn’t what we envisaged. The evolution of advanced technologies will not stop and nor will it let us as an industry stop innovating. 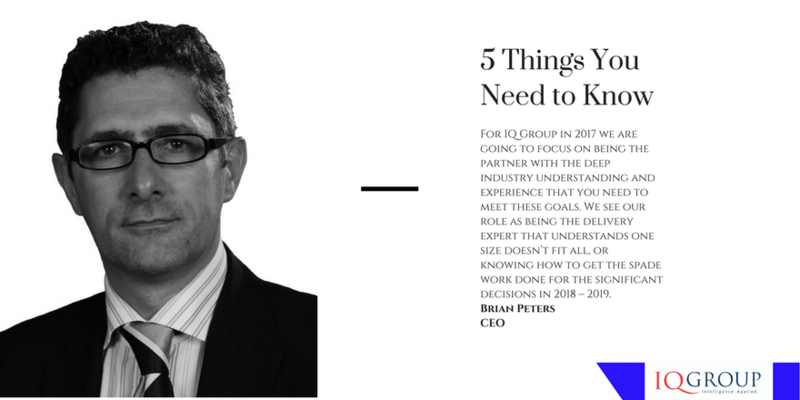 For IQ Group in 2017 we are going to focus on being the partner with the deep industry understanding and experience that you need to meet these goals. We see our role as being the delivery expert who understands one size doesn’t fit all, and who knows how to get the spade work done for the significant decisions in 2018 – 2019. Apps, investment management and record keeping systems all move at different speeds, and if they don’t line up and talk to each other you won’t be moving very fast. Adding value by integrating systems and processes, helping industry players better position themselves and be more resilient is what we do.